In 1990, ten years after Robert Mugabe took power as the leader of an independent Zimbabwe, I spent six months living and working there. I was one of about a dozen volunteers placed in hospitals, agricultural co-ops, women’s organizations, and (in my case) government offices throughout the country. Until that time, I was — for the most part — an admirer of President Robert Mugabe. He had helped lead the resistance against the racist white regime of Ian Smith, and he supported the African National Congress in its fight against apartheid. He had made great strides in improving health and education for the rural poor. Contrary to his reputation as a wild-eyed Marxist, he had welcomed foreign investment. That year I changed my mind. At the complex that housed the Department of Natural Resources in Harare, every office featured a large photo of Robert Mugabe, looking grim in his Chinese-style jacket and a miniature Hitleresque mustache that occupied only the groove of his upper lip. People I talked to didn’t seem to fear Mugabe, but they didn’t like or trust him either. Newspaper reports and rumors spoke of government opponents killed in car accidents, sometimes in collisions with armored military vehicles. As the election approached, there were attacks against the opposition, including the shooting of the vice presidential candidate. Some of my fellow volunteers saw this commercial and told me about it. Not many Zimbabweans had access to TV, so its effect on the election results would have been minor. But it provided a powerful confirmation of how far Mugabe and his party were willing to go. 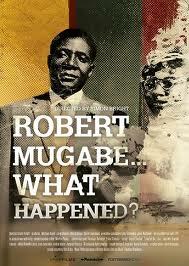 Robert Mugabe…What Happened? is a sober, responsible, and ultimately chilling look at one of the last of Africa’s generation of post-independence dictators — a man who has crushed dissent without much protest from the outside world. Why was that? In part, because Mugabe never made himself a caricature of the power-drunk madman. He did not have himself carried on a palanquin by white businessmen, like Idi Amin. He did not have himself crowned emperor, or (allegedly) dine on the meat of human beings, like Jean-Bédel Bokassa. As prime minister, then president, he retired his Mao jacket and wore dark pinstriped suits. He was well-spoken and well educated — and he was good for Western business, allowing foreign companies to mine platinum and other minerals. Mugabe was also politically convenient. As a leading member of what were known as the Front-Line States, Zimbabwe was an essential piece of the wall containing South African regime. At a time when Mozambique was being torn apart by South African-backed guerrillas for supporting the struggle against apartheid, Mugabe’s Zimbabwe provided a haven for the ANC. This was done at some risk: during my own stay in Zimbabwe, a letter bomb maimed Michael Lapsley, an anti-apartheid priest based in Harare. Finally, according to many who knew him, Mugabe could be very charming. The charm is hard to detect from most of the clips in this film, which include his statement “I am the Hitler of the times” and this telling pronouncement: “Democracy in Africa … It’s a difficult proposition, because always the opposition will want much more than what it deserves.” But you can see it for a few seconds watching him waltz with Margaret Thatcher during a Commonwealth summit. The film features the faces and opinions of an impressive number of Zimbabwean intellectuals and politicians, including journalists Trevor Ncube and Geoffrey Nyarota, former government ministers Simba Makoni and Edgar Tekere, ex-guerrilla Wilfred Mhanda, activist Elinor Sisulu, political scientist John Makumbe, and historian Lawrence Vambe. Many of them speak of their early admiration for Mugabe, but they differ in their interpretation of his career. Toward the end of the film, Simba Makoni says, “You can recall the number of awards and accolades that Mugabe received in the first decade and a half of independence, from the national reconciliation speech of March 4 : Let’s turn our swords into plowshares. Let’s be one united nation. You are my brother, I am your brother…That man, compared to Mugabe of June 27, 2008, are worlds apart.” June 27 was the date of a run-off election between Mugabe and his opponent Morgan Tsvangirai, from which government violence caused Tsvangirai to withdraw. As Bright’s own film makes clear, that time of magnificent achievements included a ruthless campaign of ethnic cleansing known as Gukurahundi: the early rain that washes away the chaff. Gukurahundi began in 1982, only two years after independence, and lasted until 1985. A unit called the Fifth Brigade, trained by North Koreans and outfitted with red berets, was unleashed on Matabeleland, the stronghold of Joshua Nkomo’s ZAPU party. They killed an estimated 20,000 civilians, some of them tortured or burned alive in their huts. It should have been clear twenty-five years ago that Mugabe was a man who would stop at nothing to hold onto power. A cynic might say that the message sank in only when Mugabe began threatening the interests of foreign investors and white commercial farmers. Yet it was not only foreigners and white Zimbabweans who failed to see what was hidden in plain sight. To analyze a tyrant like Robert Mugabe is an interesting exercise. It may even help us identify future tyrants and their tactics earlier in their careers, and to oppose them more effectively. But as Nyarota makes clear, it is equally important to consider the people they have oppressed, and what can be done to help their reclaim their country and their lives. Geoff Wisner is the author of A Basket of Leaves: 99 Books That Capture the Spirit of Africa and the editor of the forthcoming African Lives: An Anthology of Memoirs and Autobiographies. He writes for the Christian Science Monitor, The Quarterly Conversation, Warscapes, and Words Without Borders, and blogs at geoffwisner.com, where you can also find further information on his book-length projects. Robert Mugabe … What Happened? Directed by Simon Bright, produced by Michael Auret, narrated by Guy de Lancey. 84 minutes.